Burning question: If no one knows how this happened, can it happen again? (CNN) -- It's been little more than a week since an Air France jet crashed into the Atlantic Ocean, bringing a horrific end to the lives of the 228 people aboard. Recovery efforts have found several items confirmed to have come from Air France Flight 447. But the mystery surrounding Flight 447 may drag on for a great while. The Airbus A330-200 is considered an exceptionally safe plane, so why was there no signal from the pilots of a crisis? Planes, particularly sophisticated craft like the Airbus, are built to withstand severe storms like the one Flight 447 is believed to have confronted. The plane has numerous electrical backup systems, so when one thing goes wrong, another switches on to compensate. Did all those systems fail? The plane's data recorder, which might help answer that, is presumably at the bottom of the ocean. These unknowns create a stomach-turning question: If no one knows how this happened, can and will it happen again? For the past week, experts have offered theories, including weighing in on whether it's possible foul play was at work. Autopsies performed on bodies recovered from the Atlantic could provide clues, said Mary Schiavo, a former inspector general for the U.S. Department of Transportation. Schiavo, who has been an outspoken critic of the Federal Aviation Administration, told CNN last week that investigators would be able to discern if there was an explosion from possible residue on the bodies or other items. If water is found in the lungs of victims, investigators would know the plane went down intact. Cox, an expert in flight safety auditing who has flown the Airbus A320 and has flown the A330 simulator, said he suspects, as do other flying experts, that weather was not the single cause of the disaster. It was most likely a series of events, he said in an interview on CNN's "American Morning" on Monday. Cox is the founder and CEO of Safety Operating Systems, a Washington, D.C.-based aviation safety company. Air France has never been a client of the business, one of its aviation researchers told CNN. On Saturday, Air France released literature about a speed-sensing system, including an instrument called a Pitot tube. The devices are susceptible to icing in high-altitude storms. Airspeed sensors can affect the stability of an airplane, particularly if it's on autopilot. One wrong reading can make the autopilot shift the plane into a wrong direction or wrong speed. Cox said he was aware of "three to four previous cases in the fleet history" in which the Pitot tube has iced over -- a rare event. The crew of Air France Flight 447 had reported severe turbulence shortly before the plane disappeared. A dozen flights using similar routes to the Air France plane did not report exceptional weather, but aviation experts say weather can change suddenly and vary over short distances -- and passengers on at least one other flight reported what they described as bad turbulence. Investigators in Paris said Saturday that the Air France flight sent out 24 automated error messages lasting about four minutes before it crashed. The messages suggest the plane may have been flying too fast or too slow through severe thunderstorms it encountered before the crash, officials said. "What we learned by the information that the airplane uplinked to the Air France maintenance is that they had a lot of very confusing signals that the pilots would have been confronted with," Cox said. "Exactly what caused that, it could possibly be Pitot tubes or airspeed indications that could be causal in some way." The jet was 4 years old and had last undergone routine maintenance April 16. Airbus recommended that Pitot tubes be replaced on the smaller Airbus A320 planes in 2007. Air France says that last year, there were incidents in which its A330 and A340 planes lost air speed data because of icing in the Pitot tubes. Air France then began a program to modernize the Pitot tubes on its A330s and A340s. That program began in April this year, but air crash investigators said this past weekend that the jet that crashed had not been retrofitted with the new Pitot tubes. While news about the mechanics of the plane is being widely discussed, Air France has decided, out of sensitivity to the crew and passengers' families, to not disclose details about who has been recovered and the condition of those bodies. 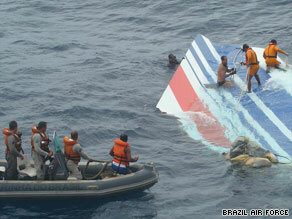 On Monday, Brazilian authorities confirmed that 16 bodies out of the 228 on board had been found. The recovery process has been arduous and painstaking for crews on the water. Where the bodies have been found, the depth of the ocean ranges between 19,685 and 26,247 feet (about 6,000 and 8,000 meters). Also on Monday, the U.S. Navy announced that it was sending two high-tech acoustic devices known as "pingers" to help search for emergency beacons from Flight 447, a U.S. defense official told CNN. That may help recover the plane's data recorder and cockpit voice recorder, which can transmit signals from as deep as 14,000 feet, about the maximum depth of the water in the area where the plane apparently went down. The flight recording devices are designed to emit a regular ping for 30 days after a crash. In addition, a French nuclear submarine will arrive in the area Wednesday to assist in the search for the data and voice recorders, according to a statement from the office of French Prime Minister Francois Fillon. While that operation is being carried out, crews will continue combing the search area, which is 77,220 square miles (about 200,000 square kilometers) -- or nearly the size of Romania. Already discovered in that area was a leather briefcase containing an Air France boarding pass with the flight number on it and a nylon backpack with a vaccination card inside, officials said. Among those on board were a member of Brazil's former royal family, a one-time performer with the Riverdance troupe, a Rio de Janeiro city official, executives from major international companies and an 11-year-old British schoolboy. CNN's Scott Bronstein contributed to this report.